Ellie Schatz is founder and president emerita of the Wisconsin Center for Academically Talented Youth (WCATY). She served as the first consultant for gifted and talented programs with the Wisconsin Department of Public Instruction, bringing extensive experience as a classroom teacher, resource teacher for gifted and talented, and gifted program coordinator to the state. She has presented to educators and parents at state and national conferences for close to 40 years, and has served as a consultant to the National Research Center on the Gifted and Talented. Ellie received her Ph.D. from the University of Wisconsin-Madison in Counseling and Guidance in 1981, with an emphasis on guidance of the gifted. She received her Masters degree from UW-Madison in Curriculum and Instruction, and her Bachelors degree from Buffalo State University College in Buffalo, N.Y. in elementary education. Ellie has taught and mentored young students and adult learners throughout her life. Ellie is the author of numerous publications related to teaching or parenting smart children. These include the article Mentors: Matchmaking for Young People, published in The Journal of Secondary Gifted Education. She co-authored the book, Teens With Talent: Developing the Potential of the Bright, Brighter and Brightest, co-presented and published the research paper, The Effects of Content, Cognitive Congruence, and Camaraderie on Talented Students’ Attitudes, and co-presented the results of a WCATY project,Young Women of Promise: A Year-Long Program for At-Risk, Gifted Girls. Her current goals in writing are to help more children understand that it is cool to be smart and to help parents understand child development principles that encourage early learning as well as fast-paced learning for those who need it. 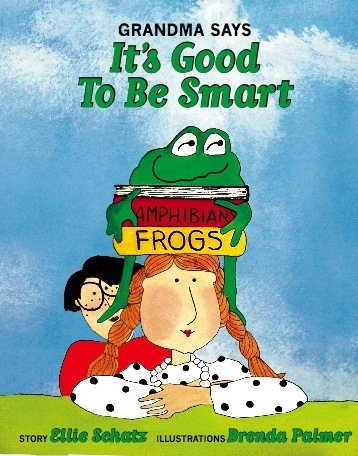 Ellie’s first children’s book, “Grandma Says it’s Good to Be Smart,” was published at the end of November 2009. The first and second printings sold quickly. Now in its third and possibly final printing from “Ellie Books,” this colorful picture book with whimsical illustrations encourages young children, ages birth to 7, to love learning and to believe that it is cool to be smart. Fewer than 25 copies remain. Ellie’s new book, “Color Me Purple,” is a story for children ages 8-12, complete with 18 related text boxes explaining concepts and theories about talent development in depth. The story is about children from across diverse cultural, ethnic, and economic backgrounds who demonstrate different kinds of talents. Based on the theory of multiple intelligences by Dr. Howard Gardner of Harvard University, the purpose of the book is to help children and adult readers to not only appreciate their own abilities, but to understand the many forms that intelligence takes. Note: Madison artist Donna Parker joins Ellie in sharing her illustrations in the book, Color Me Purple.